This post has been due since Lexi started walking 5 months ago. Such an important part of a baby‘s wardrobe. Making sure what they are wearing is comfortable, doesn’t rub, lasts through their roughplaying, looks great and is versatile (because at $30-50 per quality pair of shoe, they better last long and look great). Proper footwear is surprisingly important for your baby‘s foot health, their developing walking skills and their comfort. You have seen numerous photos of Lexi in Pedipeds. These are our go-to shoes. 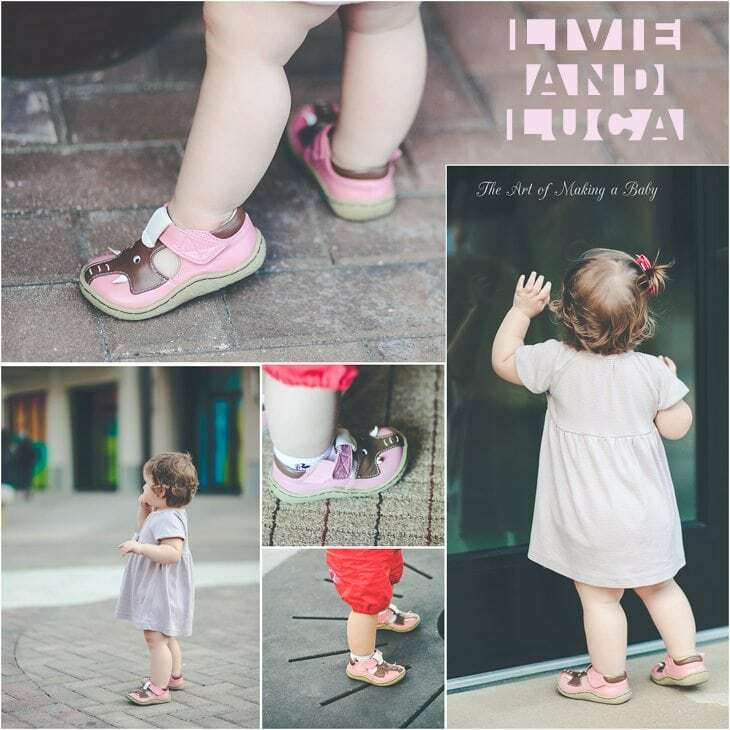 They are the most comfortable shoes that we have tried, they fit her chubby feet better than any other shoe we have tried, they do not rub, look great even after weeks of wearing and the kicker….. some styles are machine washable! Pediped is focused on quality and comfort – in order to be comfortable and ergonomic, they have to be simpler and made out of soft quality materials- but still there are some really cute styles that will make your inner fashionista happy. You can read this amazing information on their website about infant foot health, including why you shouldn’t buy second hand shoes, so it’s a really useful read if you’re interested. Aside from comfort, Pediped shoes promote foot health and proper positioning and walking. If your baby just started walking, I highly recommend buying Pediped Originals, which are soft leather soled shoes that are “next best thing to bare feet”. Read a feature on Pediped shoes on Daily Mom. These soft thin shoes are perfect for pre-walkers and early walkers. They are made of leather and have a suede sole, so they protect your baby‘s feet without preventing him/her from properly learning to walk. 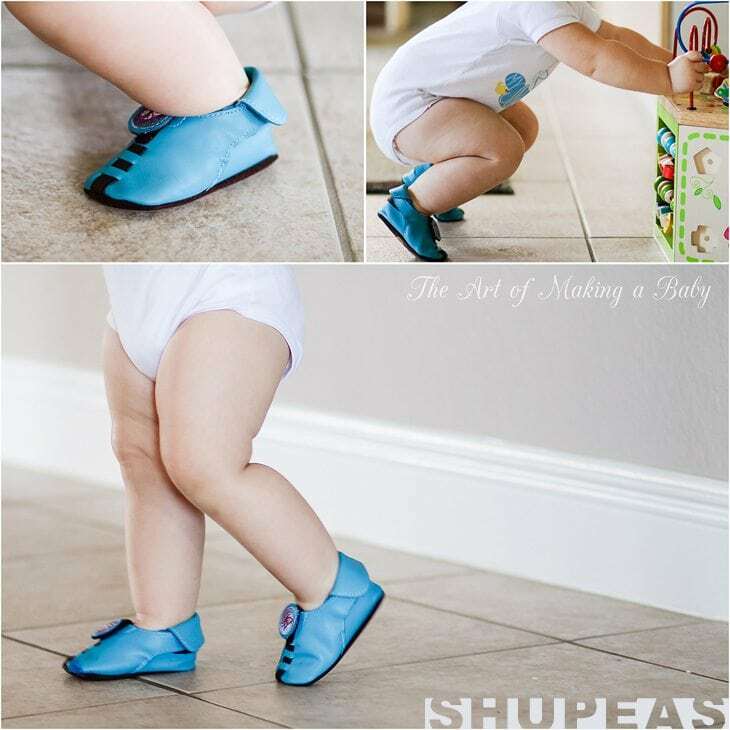 The best part about Shupeas is that they are adjustable, so, as your baby‘s feet grow, you can lengthen the sole of the shoe and adjust the back via velcroes. They go up to 18-24 months size. You can read an in-depth feature on Shupeas on Daily Mom, but if you are going to have shoes for a baby that doesn’t walk yet, these types of shoes are your best bet. Remember not to put a young baby into a hard soled shoe. This company has got to be selling the cutest boy and girl shoes on the market. The cuteness factor of most of their designs is over the top. Most are made of soft leather and a rubber sole. Our two favorite pairs are these elephant shoes and the gold birdie shoes, but they have lots of other amazing styles that I constantly drool over. Boy shoes are super cute too. In fact, the best looking boy shoes I have ever seen have been by Livie and Luca. While you’re there, don’t forget to check out a cute ladies line, too, with boho flats and vintage looking boots. They also have different options for soles to match your child’s age and walking skill. You can read more about the shoes on Daily Mom. I found out about See Kai Run from a friend of mine and then saw them on sale on MyHabit. Another company with fun designs and great shoes. They fit Lexi’s chubby feet great. I am in love with these polka dot sneakers ( their shoes look WAY better in person). The sole, side and bottom of the shoe have their signature car and everytime Lexi sees it, she signs for car and makes a car noise. They have shoes specially made for tiny feet and little babies as well as children and the selection is huge. For now these are the three companies (Shupeas is out of our age range now) that I am committed to, in terms of shoes. We were running late somewhere one day and I realized that we left Lexi’s shoes at home ( we often put her into her carseat barefoot and take her shoes with us). So we stopped at Walmart to pick up a pair of shoes on the way. I thought there were some shoes that looked cute there so I picked up 3 pairs instead of one. Unfortunately, we only wore that one pair once and the rest of the shoes sat in our shoe box for months. I attempted to put one of the pairs on her but she kept falling and showing signs of being uncomfortable, like trying to get the shoe off. Another time we had to get a pair of shoes from Gap and I couldn’t even get them on right, they kept sliding off to the side. I don’t know if it’s her foot shape, but I am completely sold on getting comfortable high quality shoes for her at least until she’s much much older and needs more pairs of shoes than just a few. I’d rather have one pair that is VERY comfortable than 3 that rub her foot the wrong way. Also I noticed that getting silver shoes means you can pair them up with virtually any outfit, so that way you can only get one or two quality pairs and they will work with their whole wardrobe. What are your favorite brands of baby shoes when it comes to looks and/or comfort? I’m always interested in discovering new brands. I’m a huge Pediped fan because my girl loves hers!! Maybe not the sandals, but the Mary-Janes for sure. We also like Tip Toey Joey shoes. And there was one pair from Walmart that was surprisingly well-cushioned, but we don’t put her in them often because of our own fears about proper orthopaedic support. We love Pediped and Stride Rite. Brandon has an extra wide foot so we can’t do any big box shoes as his foot will not fit in them. I did actually just purchase him a pair of Sperry’s which surprisingly fit him really well. I love Stride Right for my 3 kiddos. But I am a sucker for Livie & Luca little girl sandals!!!!! I loved our pedipeds until my daughter outgrew them (in 3 months! what the heck!). We had the white ones that you have. I’m not too pleased with their sandals though. They have velcros on both sides & my daughter’s feet are just too chubby I guess for them to close properly. Maybe it’s just that style. I looked at SKRs in store but they didn’t seem to flex as much as the pedipeds. Maybe it’s just the styles our store carries, hmm.. Actually, I was even a bit surprised that the pedipeds didn’t flex as much as I expected them to. We just tried TOMS today & I have to say I am in love. I’m not sure about how they compare in support to the other brands as they are structurally much lighter but my daughter seems comfortable & they flex like no other shoe we’ve tried. I haven’t tried the sandals but I’ll be getting some soon. The originals bend really well and the grip and go. It’s their other brand that is a bit hard. Nice to hear about Toms. I’ll try them. Which styles are good and comfy? I wish I tried the originals when I was first buying shoes for her. Now I think they might be too small, I don’t know.. We only have the classics in the Toms. Going to try the Mary Janes next! Have you by chance tried Scribbles? its a brand I keep seeing on zulily but as shipping is a bit higher for canada I’m hesitant to buy without knowing anything about them. I’m coming back to say that we took the Toms to the playground & yeah… no. Like everyone else said, they just fall off all the time. They were okay at the mall & at home where everything is flat but the second my daughter stumbled, ran, climbed or did anything, they fell off. Sad little shoes, I had such high hopes for them. We actually have an adorable pair of Toms, but they are impossible to get them on and off of G’s feet. We’ve never had this problem with shoes before. I don’t know if they make different styles. It made me so sad because I love the look of them. I would definitely take her to a store and try the Toms on if you are planning on getting some! Our little guy wears Stride Rite, pretty much exclusively. We also tried a pair of Walmart shoes once, and he just kept tripping in them and getting frustrated because he couldn’t walk normally… not to mention the horrible red marks they left on his feet. He has very fat little feet, haha, and Stride Rite (the XW size) works great. I’ve looked at a few Pediped shoes, but always ended up going with Stride Rite because they were less expensive and still very supportive and flexible. Shupeas were a big ugh from me. I saw them on zulily a while back and thought the styles were cute and the adjustability was a good thing, so I bought a pair. But that dang flap never wanted to stay down so it just looked silly. Good thing I bought them cheaply. My son only wore them a couple of times and then never again. When my daughter was just starting to walk she had extra wide feet and Stride Rite was the best fit for her. As she’s grown, her feet are still a little wide but she doesn’t need a wide shoe anymore. I totally agree with buying quality shoes for her though. When she was 1, I needed a pair of black shoes to go with her Halloween costume & got a pair at Walmart for $5 that gave her blisters. Never again. I have a friend who only puts cheap shoes on her 3 year old and the kid is always tripping and complaining. For a baby, I’d sacrifice style for comfort ANY day! We do a lot of Stride Rite, too, because I can get a good fit and deal at a stride rite outlet near us. I have been burned by shopping for shoes on the internet! 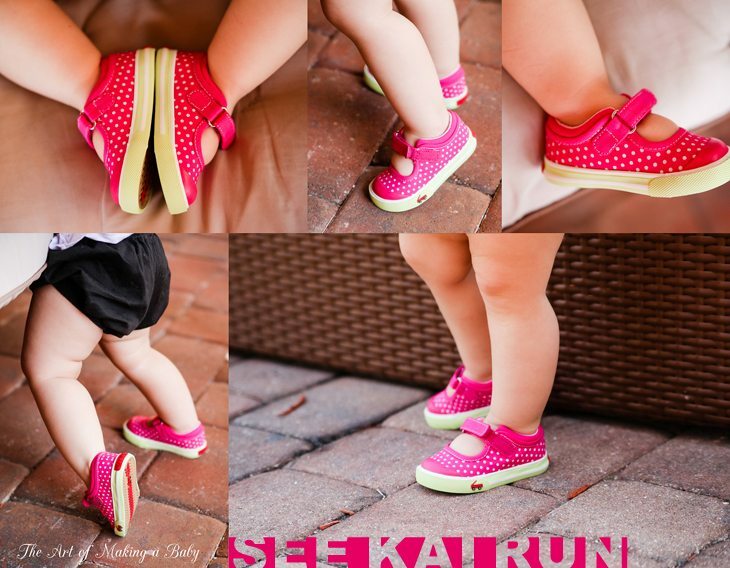 I have used See Kai Run, too, but the sole is more rigid than Stride Rite’s, but the style is absolutely adorable. One reason I prefer Stride Rite is because the rubber is grippy enough to climb up the metal ladders at the park without slipping. That is very important to us! And, we also prefer closed-toe sandals to prevent toe-stubbage! We did have a pair of TOMS and they would NEVER stay on and the rubber was not grippy. I ended up selling them. My daughter is currently using saucony sneakers and I find that they’re narrower than most brands and I doubt that they’d fit chubby feet- her feet are pretty narrow. I will go back to Stride Rite when this pair is outgrown. We buy all my daughter’s shoes at Nordstrom, because she has a condition that causes her to have two different-sized feet and they will sell a size-mismatched pair. They mainly sell Stride Rite, and that is also the brand her orthopedist favors. They have good support and nice, grippy soles. Anyway, I highly recommend Nordstrom for kiddos with hard to fit feet. They carry all the Stride Rite shoes in a variety of widths, and the sales people are excellent. I don’t know how they magically make my daughter comfortable enough to let them touch her feet. She is normally so stranger-shy. Love this post and all the cute shoe pics! I’m such a sucker for baby shoes, I think they’re the cutest things ever. How many pairs does Lexi have that fit? My son (15 months old) has 3 pairs, and my husband is perturbed that I want to buy more. Like a typical man he only has 2 pairs of shoes (sandals and sneakers) so any more is “excessive.” No fun at all! My son’s favorite shoes are his See Kai Run closed-toe sandals. He seems really comfortable in them. I also have a pair of Pedoodles, I’m surprised you didn’t mention those. They have a very, very flexible sole, more flexible than SKR. They’re still too big for him (got them from BabySteals) so we’ll see how he likes them once they fit. Lexi usually has 3 pairs that somewhat fit. Some are slightly bigger. 2 of the next size up for future. Sometimes we end up with one workable pair for days till i get around to ordering more. Worth noting also that nearly all experts recommend not putting your learning to walk baby/new walker in shoes at all…bare feet are best! We are a fan of robeez here. I think besides pedipeds and the soft See Kai Run shoes, Robeez are even more barefoot. I had the chance to ask the pediatric orthopedic doctor about shoes right when my baby started walking. He said not wearing shoes is best – otherwise just “pick the prettiest” because it doesn’t matter as far as development. All our shoes are from Jacadi – they are AMAZING! We tried different models but so far our daughter voted for them. And they are beautiful. Do you have a link to them? KEENS are great for little ones in the summer. This is the second year we have purchased a pair for my 2 1/2 year old. The toes are closed, they can get wet, and the soles have tons of grip so she can wear them on the playground, at the pool, or just hanging out around the house. have you looked into chemicals in these shoe brands? thanks!